Sometimes keeping your small gym business lean is just a matter of tying your proverbial shoelaces, sprucing up your operational practices and squeezing that little bit of extra mileage out of your resources. Even a fundamentally sound business needs to protect itself against the risk of squandering resources and frittering away advantages in a competitive market. Keeping costs down takes a mix of flintiness, shrewdness and negotiation skills. There are different parts of the business that give you opportunities to cut costs. If there is any fat in the cost of creating sales removing it gives you a bigger return for the more you sell. If it is an overhead cost, you can still make significant savings over time by finding small savings that accumulate every day. One-time savings are always welcome but cutting the costs of the business process for leaner operations every day multiplies the benefit throughout the year. If you can cultivate the habit of keeping the small spending items down it is surprising how the savings will accumulate over the long run; get in the habit of keeping costs down, and the nickel and dime expenses you forego will make a difference over the long-term. Track consumables – Do you know where all of those staplers, Styrofoam cups, and reams of paper are going? Ever feel like things just disappear. The watched supply cabinet tends to stay stocked for longer if you can pinpoint accurately any, um… disappearances. Use less paper and other office supplies – Last time I checked, reams of paper ran for around six dollars each, what pushes up the printing price is the cost of the ink cartridges. Try to print less and keep documents digital to save the high costs of paper and ink. Change your purchasing habits – Do you gain an advantage by buying supplies in bulk? If yes, start doing it, if no, stop doing it! Renegotiate your lease – Work out what can you do to reduce the monthly cost of your lease. If you are a conscientious commercial renter, you might be able to convince your landlord that a rent reduction is preferable to the threat of lost income from a vacancy. Shop around for a reduced rate on your insurance – You must have insurance in this industry, but there are plenty of agents and providers out there that want to take business from each other. Get into the market for cheaper insurance policies than the rate you currently pay. Change your billing practices – Your merchant services provider might be taking a percentage of your revenue plus a flat rate per transaction, a common practice that might be around $0.30 per sale item. If you can consolidate and reduce the number of individual purchase, it will start to add up eventually. Trade discounts for larger payments quarterly or semi-annually, it may reduce the income, but the reduced fees make them better returns on investment. Switch to cloud-based office automation and tools – There are copious numbers of apps that help to automate and manage a business more efficiently, and they usually offer free service levels adequate for small business users. Audit everything – Look into the details of any service or relationship that generates an invoice or receives a payment from your business. Again, those small marginal savings here and there might add up to an extra month or more of profits in your pocket. Check out Gym Insight Gym Management Software – If you are still using three by five cards or spreadsheets to manage your fitness club, there is definitely a better way to run your operation. If you are not using Insight already, start out for free with the free starter version and find out the value of having cloud-based tools that pay for themselves once the trial ends. It’s not always a case of one dramatic breakthrough in savings or cutting back. If you take a disciplined approach to analyzing your costs and working more efficiently, you can save incremental amounts that may be a percent or two of your revenue, but when your profit margin is down in the dumps that might be enough to get you through the lean times. Saving one hundred dollars a week in your overhead expense might be the thing that saves the day or lets you invest in the one thing that grows your business. Fagan, Lawrence. The Secret To Boosting Membership Revenue. March 31, 2016. http://blog.gyminsight.com/3754-the-secret-to-boosting-membership-revenue/ (accessed April 21, 2016). Heather. Growth Hacks for Your Health Club. January 29, 2015. http://mediacaddy.com/health-club-growth-hacks/ (accessed October 3, 2016). Wrike Guest Author. 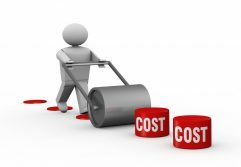 3 Easy Ways to Cut Costs and Keep Your Business Lean. August 26, 2016. https://www.wrike.com/blog/3-easy-ways-cut-costs-keep-business-lean/ (accessed October 3, 2016).